I have a weird obsession with the U.S. President. I’m a Silent Cal kinda gal. Jefferson’s Ten Rules is a list of maxims Thomas Jefferson found important enough to pass onto posterity. (The guy knew his posterity stuff.) It includes instructions like “never buy what you don’t want because it is cheap”, and “never trouble another for what you can do yourself”, although my personal favorite is, “take things always by the smooth handle”. How many sharp things did T.J. pick up before he decided we’d all do well to remember that? I was sitting in the cafeteria last week, taking my fork by the smooth handle, when I noticed something horribly wrong with someone’s feet. Just like that, I was inspired to compose Stephanie’s Ten Rules. Rule Two: Stay classy on Facebook. This is sort of a pet peeve of mine. Rule Three: Recognize that some people are bad at social cues. Use your words! I can’t tell you the number of eyebrow wiggles I’ve tragically misinterpreted. Rule Four: Make a clicking sound and use bicycle turn signals when you’re walking in front of someone. Better yet, don’t you think we should all get personal turn signals? Don’t tell me it would look weird. If everyone was wearing blinking headgear, no one would have any room to tease. Not only is it cliche, it always makes me imagine a bunch of guys in trench coats and fedoras running around doing three-legged races and playing tug-of-war. Hilarious, but not very accurate. This website lists no fewer than 21 movies containing variations on that phrase, and I promise you there are more. Rule Six: Use exclamation points with extreme caution. Exclamation points are the mullets of grammar. A sentence starts out business in the front, then suddenly there’s a party in the back for no reason at all. If I see unwarranted exclamation points, I automatically start to read those sentences like I’m auditioning for a bad movie about cheerleaders. Rule Seven: Everyone needs to see the Star Wars series once. You don’t have to memorize them. You don’t have to care about them. You don’t even have to like them. 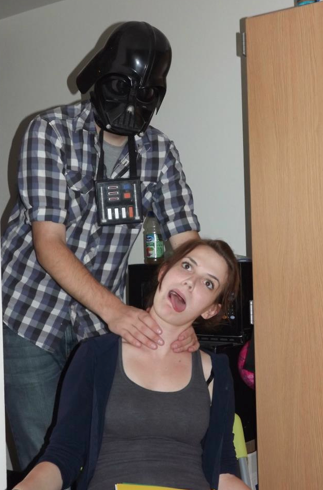 But you need to understand why some of us consider our Darth Vader Voice Changing Masks to be our dearest possession. Rule Eight: Thou shalt not play your acoustic guitar at parties, and thou shalt definitely not insist the other people present identify whatever song you’re covering. No one likes that game except you, Guitar Guy. And I hate to break it to you, but we don’t like you much, either. Rule Ten: Don’t speak unless you have something to say. I’d expand on that, but… well, you know. Rule Six is why Spanish is the world’s greatest language. Letting you know, right upfront, about how the sentence is going to end. Taking the exclamation party, Lionel Richie-style, from the ceiling down to the floor. Can you please add to Rule 1 that you cannot wear socks with sandals, either? If you have gross feet, or you’re cold, just wear shoes, please. This is the site I come visit when I need an upper, I get the giggles and can totally relate to so many of the things you write about. You’ve got such amazing writing talent – thanks for “keeping it real” and bringing a big smile to my face. And yes, I am horrendously guilty of your “Rule Six”. I’ve had to use every bit of self control not to pepper this comment space with exclamations!!! *Bugger* Keep your work up on this blog – it is AWESOME! That mullet/exclamation point comparison was solid gold. I love it. I am up till two am reading this blog. I like it. It is fantastic. OMG I just snorted at work cause I watched the video of the news anchor making fun of the Kardashian voice. Wow, that was a really good impression.